Offered by our renowned organization is an exclusive assortment of Hopper Magnets that is specially designedfor plastic industry. The hopper magnets we offer are extensively used for protecting the moulding machinery from damaging ferrous metal. In addition, they can be used to prevent various other processing equipment from the happening the same. The transparent drawer face facilitates the close and convenient monitoring of the separation. Hopper magnets can also be used to remove the minute particles of ferrous metal from various granular materials, free flowing powers, pharmaceutical, fertilizer, chemical, food, sand, minerals, clay and plastics. 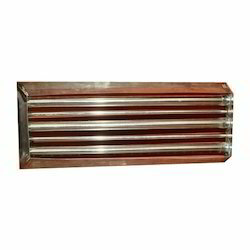 Moreover, the slide gates that are provided with these magnets helps in shutting off the flow of product. These magnetic separators are very cost-effective and offered with an easy clean design. Looking for Hopper Magnets ?